Hi. My name is Diantha, like the flower Dianthus, and I love color. Always have, always will. I’ve studied it, worked with it, played with it, wondered about it, dreamed about it, and developed a business around it. My goal was to change the world through color, and although a lofty and probably unachievable goal, my vision will always be one in which all people learn the value and power of color and how it can support us and transform us as we move through our challenges. To that end I developed a full line of color sprays which I named after my first book: Simply Color (available now at your Kindle store). The 15 Simply Color sprays were developed during the time I was doing a lot of teaching about color and I wanted something simple and easy that my students and clients could use to bring in the color they most needed. You see, the colors of the rainbow spectrum relate to our chakras, organs, glands, emotional, physical, mental and spiritual planes. When something is out of alignment, we get sick, or have issues arise in our lives. Being human beings, this happens frequently as we are here to learn, to develop our souls and to raise our consciousness. So I learned how to use color to our advantage and have taught countless others how to do that as well. For example, the color of red relates to our ability to ground and manifest. It is extremely helpful to use when we lack energy, or want to start a business, or when we desire to manifest something. Or the color of blue relates to peace, calming and communication. When I was learning to speak up for myself, blue was the color that supported me in learning and then doing that, with grace and ease. Each color also relates to an organ and gland. So on the physical level it can have an impact as well as emotionally, mentally or spiritually. When we have a challenge in life, we use up the color in our energy body that relates to that color and we need to replenish it. 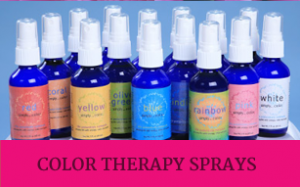 These color sprays are like liquid light, carrying the vibrational qualities of each color so that using the spray will help replenish the colors that have been diminished or lost. I developed 15 Simply Color Sprays, 10 Simply Color Children’s Sprays, 17 Simply Feng Shui sprays, and have 3 Healing Sprays. I also make custom sprays that target an individual’s needs. One of my favorites in the Simply Color collection is Rainbow. It is a great general spray for elevating one’s spirits and bathing the energy body in the rainbow spectrum. It smells lovely even though the formulas are not created for scent but for effectiveness. In the healing sprays, my favorite is Angel’s Song which was originally made for a young male who was in crisis. His Grandmother contacted me and told me what was going on and the result wass this amazingly powerful but gentle spray. Opalescence is another in this series developed to bring joy, creativity and inspiration to creative endeavors. Originally made for an artist, most people who order this are using it for it’s effervescent, magical energy. Once I created the color sprays, I also developed a full line of Feng Shui sprays. My favorite in this collection is the Wellbeing one which brings in the vibration of wholeness and wellbeing based in the core of our being. This one targets the middle gua of the 9 in the bagua, which is known as Health. And without health, we have nothing. The sprays contain a propietary blend of essential oils, flower essences, solarized and charged water, gem elixirs and energetic infusions. Each one is infused with the essence of love because I believe that the vibration of love can elevate the consciousness of the planet to its next level of development. So perhaps my original dream of changing the world CAN come true. With many of us working towards that end, I think it will!